If you came face to face with a black bear, and the only thing between you and the bear was a pair of small Tahltan Bear Dogs, you would have had have little to fear. On a hunt, the Tahltan people carried the little dogs in packs to conserve their strength until fresh bear tracks were found. Then the dogs would be turned loose. Being small, they were light enough to run on top of crusted snow that would not support larger animals. Working in pairs, one dog would annoy the bear from the front while the other attacked from behind. The dogs were nimble and quick, darting in and out and nipping the bear while avoiding its teeth and claws. They would hold it at bay until the hunters arrived to kill it, or until the bear’s nerve broke and it went up a tree or ran. The dogs also guarded the camp at night. One of the last registered Tahltan Bear Dogs. Owned and bred by Harriet Morgan of Ontario. Tahltan Bear Dogs were a primitive spitz-type breed. The females only came into breeding heat once a year, like wild canines, whilst most domestic dogs have two heats per year. The original Tahltan Bear Dog had a short, dense, harsh coat, large erect ears and a foxy face. Its tail was six to seven inches long, standing straight up with the hair fanned out like a brush. Longer tails may have been docked to achieve the correct length. They averaged 14 to 17 inches tall. 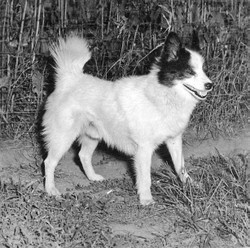 Most dogs were black, often with white markings, but some were steel gray. White dogs with black or gray spots were less desirable, and those with long coats are believed to be crossbred with other types. The most famous Tahltan was Stickeen, the hero of a book of the same name written by California naturalist John Muir, who travelled extensively in Canada's northwest. The Tahltan became quite well known in the 1930s and was added to the list of Canadian Kennel Club recognized breeds in 1939 or 1941. Unfortunately, the breed never caught on with outsiders, possibly due to stories that Tahltan Dogs always died when taken south. Such deaths likely resulted from diseases of domestic dogs to which this northern breed had no immunity. By the mid-1970s, purebred Tahltans had almost disappeared in Canada. A few were found, but all already had been spayed or neutered, and no breeding stock was available. With no new registrations and the breed nearing extinction, the C.K.C. removed the dog from the Sporting Group in 1974. A Tahltan man with his Bear Dog. A mostly white Tahltan Bear Dog. Dogs in Canada. Used with permission. Three Tahltans in 1943. Left to right: Ted-Jut, Etzerza and Klappan. It is unknown if any purebred Tahltans remain in British Columbia, but there are still mixed breed dogs in the Atling and Ross River area of B.C. that show Tahltan characteristics. A search by a C.K.C. representative and judge a number of years ago found no remaining purebreds. While a dog that looks like a Tahltan could be recreated by “back-breeding” from these part-Tahltan dogs, there are doubts that they would still have all the other characteristics that made the breed special without testing them to see if they still had the original instinct to hunt. Occasionally, people advertise “purebred” Tahltan Bear Dog puppies for sale. Buyers should be aware that, given the extreme rarity of this nearly extinct breed, it is highly unlikely that the animals being sold are the real thing. The photo of the three Tahltans is from an article written by J. Blakiston-Gray and published in Dogs in Canada, January 1943 and used with permission of Dogs in Canada. The original caption reads, "Three typical Tahltan Bear Dogs. Left to right, they are: Ted-Jut, Etzerza and Klappan. Note the fox-like head and general keenness. Ted-Jut and Etzerza are owned by Constable Gray."